The Target Saver: Macy’s: 6-Piece Clinique Discovery Kit ONLY $15 Shipped + Free $10 Clinique Credit! Macy’s: 6-Piece Clinique Discovery Kit ONLY $15 Shipped + Free $10 Clinique Credit! Right now Macy’s.com has this 6-piece Clinique Discovery Kit for ONLY $15 shipped (a $70 value)! 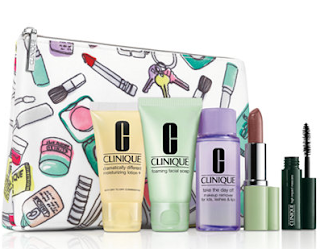 To make the deal even better, this bag includes a $10 Clinique credit redeemable with your next Clinique purchase valid through 2/28/18. This Clinique Kit includes Dramatically Different Moisturizing Lotion+ 30 ml, Foaming Sonic Facial Soap 30 ml, Take The Day Off Makeup Remover 50 ml, Long Last Lipstick in Bamboo Pink, High Impact Mascara Mini in Black and a signature bag!